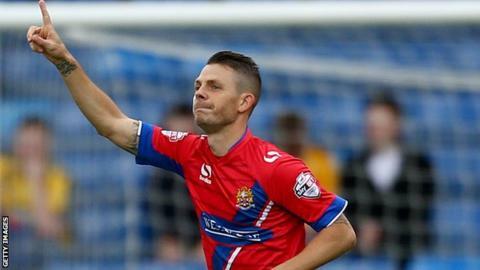 Veteran Dagenham & Redbridge striker Jamie Cureton hopes he can reach the landmark of 300 career goals before retiring from playing. The 39-year-old hit his sixth goal of the season, and the 264th of his senior career, in the 1-1 draw at Wycombe. "I know it is quite a way off but if I play another two years, there is a chance," he told BBC London 94.9. "I try to set goals. They might seem a bit far-fetched at times but it gives me something to aim for." Cureton made his professional debut for Norwich City in November 1994 and has made a total of 768 appearances for 13 different Football League clubs. The Bristolian, who says his love of the game is the reason for his longevity, joined Dagenham on a free transfer this summer after leaving Cheltenham Town. "At my age, I have to score to keep getting a job somewhere. I still get very down when I don't score and miss chances," he added. "I'm pushing to get as many goals as I can. That is something I will always push myself to, as long as I am playing. "Around 800-plus games and another promotion would be great. I've got three golden boots and would like another one. "I'm quite greedy - but if you don't give yourself targets, you can sort of drift along." Daggers boss Wayne Burnett has hailed Cureton's attitude and application since his move to east London. "I have to manage him and sometimes have to drag him off the training field, because he wants to stay on it," Burnett said. "It is no coincidence that he has scored the amount of goals he has. He has got wonderful movement, is a good finisher with both feet and is a very, very clever footballer. "He has looked after himself and is a student of the game. Age is a number but he is playing like he is 21 or 22." Cureton admits to being involved in the drinking culture which was a part of professional football in the mid-1990s, but now says managing his body has been a crucial reason in prolonging his career. "I caught the back-end of the so-called drinking culture," he said. "Back then you didn't realise what you put your body through, whereas now you're more of an athlete and there is a lot more science. "Trying to stay away from injury as much as possible is key. When you pick up little niggles, they hang around a lot more. I don't think I ever wake up and feel 100%." When Jamie Cureton scored his first senior goal, for Norwich against Chelsea in December 1994, current Dagenham & Redbridge team-mates Jack Connors and Matt Partridge were less than two months old. Cureton is yet to make any specific plans for when he does eventually hang up his boots, but already does some media work and has started taking his coaching badges. "You never know. At any point something might come up which takes my fancy," he said. "It would be a shame for that to happen and not to have the qualifications to take it on. "I think whatever field I end up in, it will be to do with football. I left school with nothing and it has ended up being my life. "I would imagine it will continue to be my life until I end up calling it a day. I think I've got another 20-odd years of giving something back to the game once I retire."